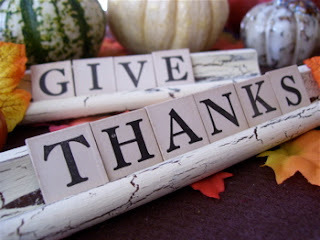 November is the month of giving thanks. I have many facebook friends that have been posting one thing they are thankful for each day from November 1st through the big turkey day tomorrow and I have greatly enjoyed reading what they have to say each day ﻿As we have gotten closer to Thanksgiving it seems as though everyone is creating a list (and checking it twice) of joyful things. At church on Sunday we were given the opportunity to stand up and share with everyone what we are thankful for and one guy stood up and said that he is thankful for the good and the bad things. (yes, he is smart...that's what a Graceland education will do for you!) I instantly knew that I agreed with him and that I would blog about it, but why? Why do I need to be thankful for the bad things? I want to forget the bad things, not search for a reason to be thankful they happened. The obvious answer to me is because without bad moments there would be no good moments. You wouldn't know what a good moment was if you didn't have those bad moments to compare them to. How can I appreciate the days where everything seems to be going my way and I can't stop smiling if every single day was like that? The reason those days are so good is because I am able to remember the days where nothing seemed to be going my way and I had to force myself to smile. I have been thinking about this for four days now and I still feel like that is the weak answer. There has to be something deeper that I am missing...right? As I have struggled with this question in every quiet moment I've had I have started to think about my own personal bad moments and why I was thankful for them. Bad Moment: Some wrong numbers hit on the calculator resulted in not being able to pay a very important bill. Thankful for that moment because it provided me an opportunity to face a weakness and come out on top. I am stronger because of it. Bad Moment: Being sick. Thankful for that moment because it forced me to listen to my body and get some much needed rest. Bad Moment: Tripping and falling in the middle of a restaurant. Thankful for that because now whenever I trip over something I remember the time I fell on my face in front of a room full of strangers and know that this time can not be as embarrassing as that time. Plus it helps when you do something embarrassing like that and can follow it up with an even more embarrassing story of yourself and have a good laugh with everyone. As I was driving home last night, talking to myself about the bad moments I realized that I was not struggling to find the positive spin. Finding the positive spin is easy, believing it is whole other story. Sometimes it's easy to spot and believe in the good that will come out of our bad moment. Sometimes it takes days, weeks, months, or even years to be able to even find the positive and even longer to truly be thankful for it. Take comfort in knowing that the positive spin is coming and keep your mind open to new possibilities.